Leading Manufacturer of steel strap (composite) from Pune. A Composite steel strap is a patented composite material which is engineered to replace steel strapping. It is manufactured with a new innovative recipe which includes a patented additive which gives it the strength of steel strap. Also because of our patented additive, unlike PET strap, Polysteal strap has low elongation character. It is also much stronger than PET Strap. It is only 100% Substitute for steel strapping available. 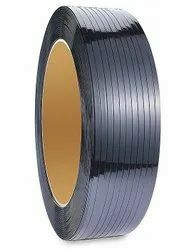 Looking for POLY- STEEL STRAPPING ?